Your Grace is Sufficient: Will the real Pharisee please stand up? One of the most common methods used to summarily end discussions involving morality, would be to resort to the ad hominem label of calling your opponent a “Pharisee.” It’s a catch-all term that would include, though certainly not be restricted, to the following connotations - “hypocritical,” “self-righteous,” “judgmental,” “moralistic,” “small –minded,” “legalistic,” “anachronistic,” “caught up in pomp and pageantry and the externals!” The term has indeed been used to mock, ridicule and silence. Unfortunately, the term has often been used these days to attack Catholics who attempt to defend Tradition and the official teachings of the Church. By doing so, these persons, and by extension the Catholic Church, are ‘judged’ to have absolutely no basis to ‘judge’ or correct anyone whatsoever, since they are modern day versions of that most hated group. But let’s now move away from myth to reality. Who were these Pharisees? And more importantly, why did Jesus condemn the Pharisees so often during his public ministry. Was it simply because they followed the rules and traditions? It’s not difficult to have this one dimensional and unflattering view of the Pharisees, as they are often lumped together with the rest of the groups. often portrayed as the bad guys, who resisted Jesus at almost every turn and conspired to have him killed. It is true that there were Pharisees who criticised Jesus and his disciples for not keeping the law and consorting with sinners. Jesus in reply called them hypocrites and accused them of leading people astray. But there was another side to the Pharisees. During the reign of Herod, they opposed him to his face and the Roman occupiers too. On account of this, the Jews applauded them. In the eyes of the Jews of the time, these Pharisees were seen as the heroes of Jewish liberation, brave men, who helped to preserve the religious integrity of the people of God. Religiously, they accepted the scriptures as God-given, and not just the Torah, as the Sadducees selectively did, but the entire corpus of the Old Testament. Their names were derived from their desire to live pure, separated lives, (Pharisees – The Separated Ones) separating themselves from the world and all its corruption. They demanded radical commitment to the laws of purity and tithing. Lastly, their most important contribution was the preservation of the Jewish faith after the destruction of the Temple in A.D. 70. If they are so commendable, why would Jesus then issue such harsh condemnations against them? Let’s look at what Jesus says in today’s gospel. The first accusation is this: Jesus, quoting Isaiah, calls them hypocrites who “honours me only with lip-service, while their hearts are far from me.” Therefore the first sin of the Pharisees was religious pretentiousness. In the Jewish Talmud, the first kind of Pharisee that was condemned was termed the “shoulder” Pharisee, who wore his good deeds on his shoulder for everyone to see. They were condemned not so much for their beliefs or their practices but for their lack of integrity, the lack of cohesion between expressed desires and true intentions. Jesus is bringing to light a common fault among many, that is the large separation between what we say or what we do. A religion that is pretentious, that is only a façade is a false sort of religion. It is no wonder when Jesus cautions his disciples about pious practices such as fasting, alms giving and prayer, he rails against a showy form of a religion, one which is intended not to please God but to earn man’s honour and praise. The second accusation against the Pharisees was that they had substituted doctrines with human regulations, divine commandments for human traditions. The problem we face today is there is an unreflective risk of equating the Catholic Church and its Tradition to all that is man made: “human regulations” and “human traditions.” It follows that being man-made they can be revised and even cast aside. This is a serious failure to understand what Sacred Tradition constitutes and also what Jesus meant by his words. Sacred Tradition is not a human addition to Sacred Scriptures. Rather, both Sacred Tradition and Sacred Scripture are derived from the same source, the Word of God, one oral and the other written. The word “tradition” comes from the Latin “tradere” which means to “hand over” what we have received from Jesus Christ and his Apostles. It is a call to a fidelity to the teachings of Christ and His Apostles, and certainly not a license for innovation. Whenever we seek to depart from the Tradition of the Church, whenever we seek to apply our own private interpretations to scriptural text rather than rely on the guiding light of the Magisterium, we risk substituting divinely instituted commandments and teachings for “human regulations” and “human traditions.” Nothing exists in a vacuum, when you have thrown out Tradition and the Church’s laws, you merely substitute them with your own set of personal self-serving opinions, rules and policies. It is therefore inaccurate to misrepresent the dispute between the Pharisees and Jesus as a dispute between the rigid, legalistic, close-minded Pharisees clinging to the letter of the law whereas the merciful Christ liberally went beyond the letter of the law. This is a widely held myth. Not only did Jesus have no intention of changing the Law or even of calling for a more lenient application; in contrast He came to require a “greater perfection” in observing them. Jesus came not to lower the bar but to raise it. The Pharisees did not oppose our Lord because he offered a more lenient or tolerant interpretation of the Law; it was the exact opposite. They sought to use sophistic interpretations to minimise compliance with the mind of the lawgiver. They were experts in looking for loopholes. Finally, the Pharisees of Jesus’ time as well as modern-day Pharisees, often suffer from an acute self-righteousness that blinds them to their own faults. 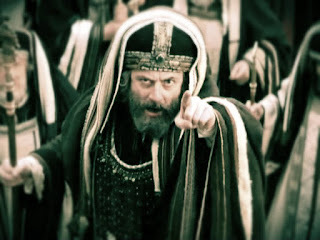 Have you not noticed that no one voluntarily admits that they are a Pharisee? It’s always someone else. In wanting to catch others with their pants down, they fail to recognise that they are sinners too. The moment we accuse someone else of being judgmental, we inevitably fall into the same trap. And finally those who believe themselves to be perfect will end up not needing Christ nor His salvation. They sentence themselves to damnation. At the end of the day, the problem isn’t about rules or traditions themselves. Although it is common in today’s antinomian world to condemn anyone who supports Tradition, Church disciplines, liturgical laws and rubrics as “Pharisaical” this clearly was not the point of Christ’s warning. After all, Jesus himself came not to abolish the law and the prophets but to fulfill and perfect them (Mat 5:17). As the first reading affirms, the Law was a gift from God, not to constrict or inhibit His People, but to illuminate the path of their lives. The wisdom of the Church’s teachings ultimately lead us to aim much higher, to aspire heavenly virtues, to reach for the sky, to surrender all and to even offer our lives in humble sacrifice for the grand prize of eternal life.